Smackdowning down the boundaries of the ring: Women’s Boxing and MMA! Saturday night, Strikeforce aired a fabulous night of MMA bouts on Showtime that included Ronda Rousey’s (5-0) stunning take down of women’s bantamweight title holder Miesha Tate (12-2) with an armbar submission 4:27 into the first round. In Rousey’s crowning as the new MMA bantamweight champion, heads are turning because of the high caliber of the effort both of these women put into the fight, but the “chops” they brought with them. Rousey is a an Olympic Bronze Medalist in Judo, and Tate has been a sure-fire crowd pleaser since entering the ring. Sarah Kaufman’s efforts against Alexis Davis were also hailed as “good” MMA. So here’s the question: Where is women’s boxing in all of this? What we are not seeing is the willingness of Showtime, HBO and ESPN to air these elite female fighters on their boxing shows. It’s not as if the caliber of fighting isn’t there! Flash back to the incredible displays of boxing prowess at the women’s Olympic Team Trials for one, but more importantly, take a look at the professional women who box their hearts out for a pittance, grateful for the opportunity to box at all nevermind a chance at a video stream. And if you’re looking for a case in point, look no further than undefeated IBF female super featherweight title holder Amanda “The Real Deal” Serrano’s (14-0-1, 9-KOs) February 17th effort against Ela ‘Bam Bam’ Nunez (11-13-2) in an eight round co-main event non-title bout in Chicago. Boxing websites such as Philboxing.com are calling the battle an early contender for “fight of the year” status, but otherwise, it’s not as if the offers are pouring in to Serrano who puts on that caliber of fight EVERY TIME she enters the ring. The fight was streamed live and for free on 360boxing.com, and for those lucky enough to watch the fight, it was a boxing treat albeit, within the parameters of a video stream with lagging images and breakups. Imagine how much better and more exciting it would have been if it had also been promoted on Showtime? So again, what’s the deal? How about putting women’s MMA and Women’s Boxing on the airways! And P. S., female boxers are VERY capable of fighting three-minute rounds! 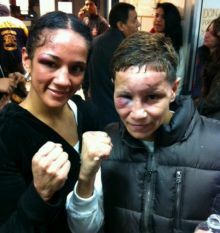 In case you missed it, here’s the Serrano v. Nunez February 17, 2012 fight. You be the judge. It has been an interesting dynamic to say the least. The current trends have been for both boxers and MMA fighters to try each others sports. MMA Fighters Liz Carrerro and Lacey Schukman both made their pro boxing debuts in the past year; and boxers Holly Holm and Jodie Esquible have been very successful in MMA. In both cases, it has given more opportunities to fight during the year versus simply waiting for a promoter to give you a call. Most major promotions like Strikeforce won’t let you do both, but it expands the audiences and gives women in fight more exposure. Thanks for your comments. What I can’t get is why women’s boxing is kept *off* the airways. I know, it’s weird. I’m guessing it’s a legacy from the very early entries of the sport on to PPV which were uneven at best. Meanwhile, if a sports executive caught bouts broadcast from Europe, Mexico or Argentina, they could only shout “wow” at how fantastic these elite professional boxers are … not to mention the non-stop action. There is no “rabbiting” in women’s boxing! I think you’re correct in your assessment, Niamh. It certainly has been a marketer’s dream in terms of how quickly the sport has grabbed interest and their ratings are impressive. Perhaps it’s precisely the ferocity that people find so appealing coupled with just a few rounds to “do combat.” What’s also interesting is the return of such things a cauliflower ears, which are certainly pretty much absent from boxing given that the gloves don’t cause that kind of damage. Still as you point out they can both be dangerous. From the lenses of female participation — it is at least terrific to see women’s bouts receiving the same marketing push and importantly visibility on the live broadcasts of such organizations as Strikeforce, however, I’m still perplexed as to why it hasn’t translated into presentation of female boxing bouts on the major American sports channels. Thanks for the link! His basic thesis is that while there are women who are winning their bouts — they are not “pure” MMA practiioners and that until more women come up through the MMA ranks to participate the sport may suffer. I don’t agree because the pioneers who are willing to enter the cage are bringing in fans. This is somewhat analagous to women’s boxing in that the early going saw women coming into it very late from a sports timeline perspective, however, today’s professional female boxers are exceptionally well-trained and well-schooled in the art and owe their careers to the efforts of their “older” sisters. I saw the Tate-Rousey fight and it was pretty spectacular. I hope to see more women’s MMA in the future. I can’t really comment on women’s boxing because I have never watched it but I think everyone should get their fair shot. If they give women’s boxing a chance and paying viewers don’t want to watch it then maybe the world isn’t ready for it but they should at least get the chance to see if people want to pay for it. « Keisher “Fire” Mcleod-Wells set to fight on March 7th @ Broadway Boxing!